I just got this great set of measuring spoons from MagiKuchen. This is a very nice set of measuring spoons. They have rubber silicone on the handles so they are really easy to hold and handle. The cups are stainless steel and are really sturdy. You don’t have to worry about them break or bending at all. They come on a great ring that you can use to keep them all together and not lose any. However, it is easy to take them off the ring if you need to for cooking. I love to cook and bake so I love having really well made quality tools and these are very nice set of measuring spoons. You get a set of five (3/4, 1/2, 1 teaspoon & 1/2 and 1 tablespoon). 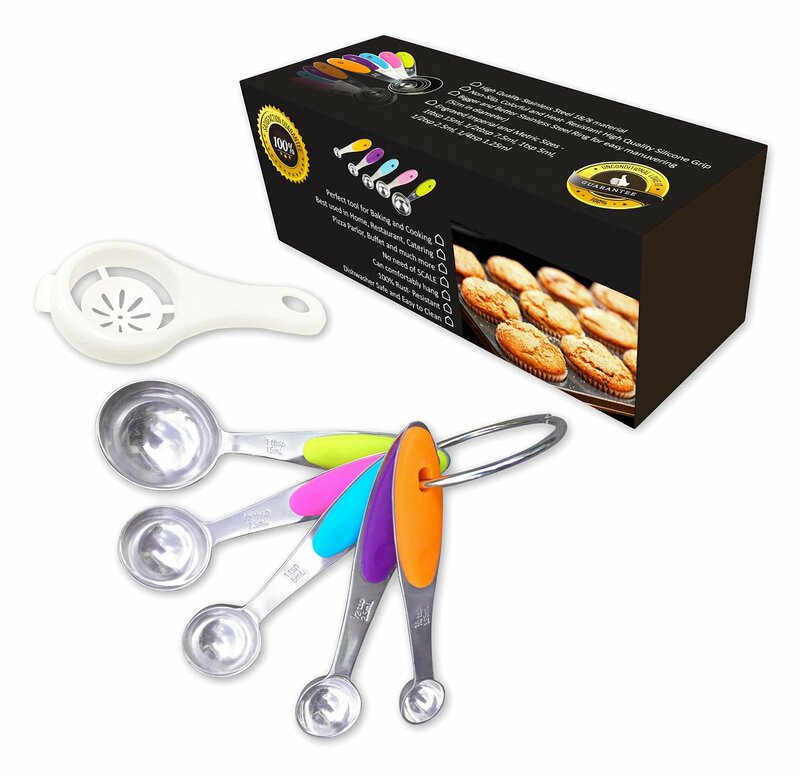 ★★★ DISCOVER PREMIUM QUALITY SET OF 5 MEASURING SPOONS made from 18/8 Stainless Steel i.e. SS 304 ensuring Durability, 100% Rust – Resistance for Lifetime. Mirror finish, smooth and polished edges. BIGGER BETTER METAL RING ensures easy manoeuvring or sliding of spoons. These progressive spoons stay together and can hang nicely on stand or rack. ★★★ THANKS TO THE ENGRAVED US & METRIC SIZES – 1/4 tsp (1.25 ml), 1/2 tsp (2.5 ml), 1 tsp (5 ml), 1/2 tbsp (7.5 ml), 1 tbsp (15 ml ) on the handles ensuring life long easy to read markings. 100% Dishwasher Safe and easy to clean with hands too. ★★★ EXPERIENCE the Non- Slip, Strong, Secure and Heat Resistant Silicone colorful handle providing the ultimate comfort. Must have tools for everyday cooking food and baking cakes, cupcake etc. Perfect round spoon shape fits easily into spice jar, soda container etc. Ideal use for home, restaurant, pizza parlor, buffet, catering and much more. No need of Scale, measure small amounts accurately. Works perfectly to measure powdered yeast for bread making. ★★★ 100% MONEY BACK GUARANTEE: If, For Whatever Reason, You Don’t Absolutely Love Your MagiKuchen’s Measuring Spoon Set, Just Return It, And We’ll Refund Every Penny. Be our VALUED customer forever. These gloves are awesome! They are super protective and will protect your hands. You can use them when you are grilling, baking, or cooking. It is really think material though so cooking might be hard to do. I used mine when baking. I could take the pans out without burning myself without even having to use a pot holder! It’s grilling season here so I use them out on the grill too! It’s so hard to find something to use on the grill that won’t burn you or won’t catch on fire like a towel. They are easy to use, just slip them on and you are ready to go! They are made of a very thick silicon material so I don’t see them tearing anytime. I am loving mine! Are you tired of your oven mitts soaking up water or burning your hands? 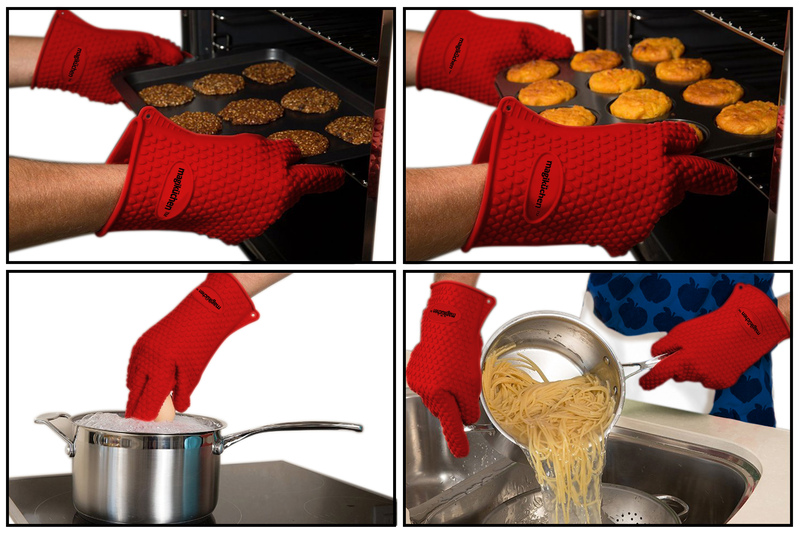 Magiküchen Heat Resistant Silicone Cooking Gloves are the best solution! NO MORE grabbing of nearest towel or handling the meat on grill with little Forks, as the Magiküchen’s Heat Resistant Silicone Cooking Gloves are the substitute for all Cooking, Grilling and Food Handling. ✔ FOOD SAFE: Includes 1 pair of built to last, BPA free and FDA approved pure 100% Food Grade Silicone Grill Gloves – Perfect of Kitchen. ✔ MAXIMUM PROTECTION: Protect your hands and avoid accidents while cooking, baking, BBQ, grilling, pot holding, camping, opening hard to open jars/cans and so much more! ✔ HEAT RESISTANT: Durability for temperature upto 446° F – Far more protection, versatility and dexterity than Oven Mitts. ✔ STRONG GRIP & WATERPROOF: No slip five figure design allows safe movement of hot items with a strong grip. Also 100% waterproof, stain free and dishwasher safe for easy clean up. ✔ SATISFACTION GUARANTEED – We offer a *MONEY BACK GUARANTEE* so you can buy with absolute Peace of Mind. If you are not 100% satisfied, you get your Money Back. Plus we offer No Questions Asked Lifetime Free Replacement Guarantee. WE LOVE USING THESE GLOVES & YOU WILL TOO!